In Lucian Freud’s portraits, painted over weeks, months or even years, we see a body of work that examines the complex relationships between artist and sitter. Looking more broadly, we see paintings that deal with the psychology of looking. Curated by artist Daphne Wright, this exhibition takes these specific aspects of Freud’s intimate studio practice as a starting point to explore themes of vulnerability, longing and loss that permeate the painter’s work. Wright looks to other artists who also address the inherent complexities of representation in their work, placing a number of Freud’s paintings alongside the work of writers Emily Dickinson, John Berger and Lydia Davis, psychoanalyst Sigmund Freud, singer Johnny Cash, and artists Gwen John, Alice Neel, Kathy Prendergast, Wiebke Siem, Marlene Dumas and Thomas Schütte. The Ethics of Scrutiny calls into question how we see ourselves, how our gazes fall onto one another, and importantly how our identities shift over time. IMMA has secured a significant five-year loan of 50 works by one of the greatest realist painters of the 20th century, Lucian Freud (1922-2011). Renowned for his portrayal of the human form, Freud is best known for his intimate, honest, often visceral portraits. Working only from life Freud’s studio was intensely private and he mainly worked with those he was close to, often asking subjects to sit for hundreds of hours over multiple sittings to better capture the essence of their personality. During this unique five-year project IMMA will present a series of different and exclusive Lucian Freud related exhibitions, with a new programme of events and openings each year, including works and new commissions by other modern and contemporary artists in response to Freud, and will reveal exciting new perspectives on this major artist today. Ethics of Scrutiny is the first of these Exhibitions. Monies raised through admission charges will directly contribute to the care and development of the IMMA Collection. Admission will be by timed entry, due to the number and delicate nature of the works and the limited circulation space of the historic building that houses the Freud Centre. To avoid disappointment please pre-book your preferred time-slot online in advance of visiting. Online booking will open on Monday 12 February 2018. This exhibition is on display in the Freud Centre which is located between the Formal Gardens and the main gate on Military road. Please note that entrance to the Freud Centre is by timed ticket only. Please purchase your ticket in advance of attending the exhibition as tickets are not available for purchase at the Freud Centre itself. Tickets may be bought online (from mid Jan 2018) or in-person at the box office in the main IMMA Reception (off the courtyard). Please note that rucksacks and large bags cannot be brought into the Freud Centre and must be left in the free lockers provided in the Main Galleries. Therefore if you are bringing a large bag please allow at least 20mins to stow your bags and make your way to the Freud Centre. If you have your printed ticket or have saved your ticket to your mobile device you can make your way directly to the Freud Centre. If you are purchasing your ticket on-site at IMMA please allow at least 10minutes to purchase your ticket in person and walk to the Freud Centre. Entry is not guaranteed during busy periods as capacity is strictly limited for each time slot. Booking online will guarantee entry for your preferred time slot, avoid queues and allow you to proceed directly to the Freud Centre on arrival at IMMA. There are no booking fees for purchasing online. Please read the ticket Terms and Conditions in advance of your visit. Lucian Freud was born in Berlin to Ernst, the architect son of psychoanalyst Sigmund Freud and his wife Lucie Brasch. In 1933, age ten, Freud fled with his family to England, ahead of the rise of Nazism. The family settled in London where Freud lived for the rest of his life. Freud studied at the Central School of Arts and Crafts, London and Cedric Morris’s East Anglian School of Painting and Drawing in Dedham. His first solo exhibition, at the Lefevre Gallery received critical acclaim in 1944, followed by a number of hallucinatory, finely-painted portraits that marked him as an artist to watch. Freud’s adherence to realism and focus on the human figure, when abstraction and other progressive forms of practice were more prolific, moved him in and out of the spotlight until the 1980’s when renewed international interest in painting and figuration gave his work a new significance. Since then Freud has become one of the best-known and most highly-regarded British artists of the 20th century. He was awarded the Companion of Honour and the Order of Merit. 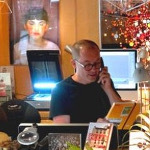 Major retrospectives of his work were held in Tate Britain, 2002, IMMA 2007, MOMA, 2008 and the National Portrait Gallery, London in 2012. Freud visited Dublin and Connemara in Ireland in the late 1940s,partly on a pilgrimage to Jack B.Yeats whom he considered the greatest living painter and later when married to Caroline Blackwood of the Guinness family. From the 1950s he connected with Irish artists such as Patrick Swift whose Dublin studio he used and Edward McGuire whose tutor he was at the Slade Art School, as well as the literary circle of Patrick Kavanagh, John Montague, Brendan Behan, Anthony Cronin and their Soho milieu. An in depth account of Freud and Ireland will be explored through the Freud Project, including his close links with the other great figurative painter of the 20th century, Irish-born and London-based, Francis Bacon – his friend, mentor and great rival of thirty years and whose studio you can visit in Dublin City Gallery the Hugh Lane. A series of Freud Project related talks and events will be published throughout the year. Please check this page regularly for the most up to date listings. Read about the first exhibition of the IMMA Collection: Freud Project where all 50 works of this five-year loan where on view for the first year of the project. This exhibition took place from 21 October 2016 – 7 January 2018. 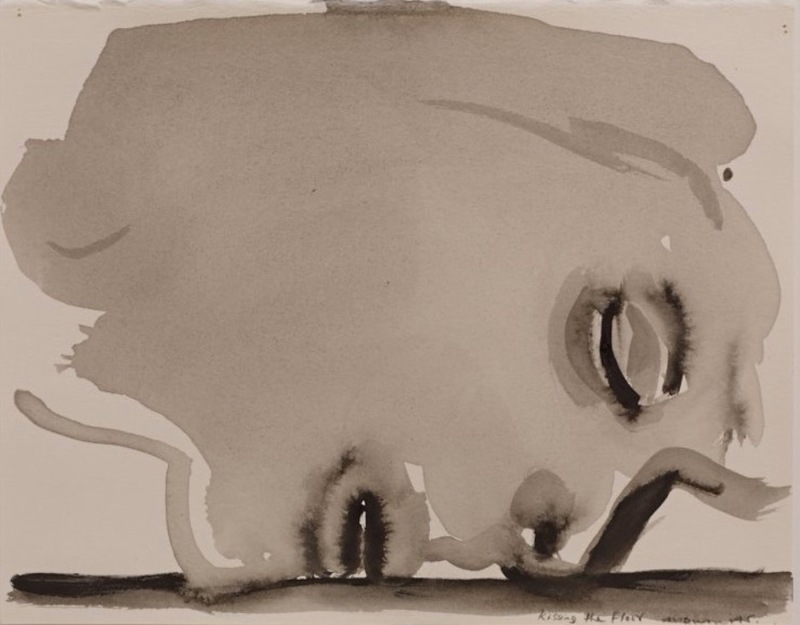 Image: Marlene Dumas: Kissing the Floor, 2014 / Watercolour on paper / 27 x 22 cm / Private Collection, London. Courtesy of Frith Street Gallery.